We were fortunate enough to welcome Haim to Brighton on the 12th of April. He enlightened us with his talk the history of the so-called ‘left’ in Israel. Many in the audience were so inspired by Haim’s talk that they asked for links to his website, and to related websites. The links are provided below, together with some of the background information about Haim that was included in the advance publicity. Haim has been a prominent critic of Zionism, the Occupation and Israeli apartheid for many years. He was Professor of Film Studies and Chair of Cultural and Media Studies at the University of East London and is Professorial Research Associate at the School of Oriental and African Studies. Haim is a prolific writer and filmmaker. 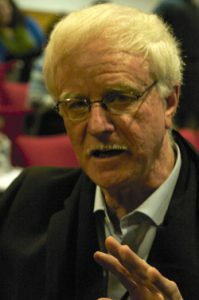 His books include the bestselling ‘Introduction to the Holocaust’ and his edited publications include ‘The Gulf War and the New World Order’ and ‘The Conflict and Contemporary Visual Culture in Palestine and Israel’. His films include ‘London is Burning: Painful Conversations’.